This archive holds all posts form April 30, 2014. The crowd goes silent. It’s quite as a Klan meeting after votes were counted during the 2008 U.S. Presidential election. Commissioner Adam Silver is at the podium. The clock only has 1 second left. The pressure and anguish is evident by the sweat and robotic voice and awkward body language on display as he begins to speak. The score is tied between our reigning champion Injustice and the never surrendering challenger—Justice. He begins to speak. It’s a beautiful released decision that indicates Donald Sterling will get the “big boom” while we, the remanding onlookers can rest assured that justice has prevailed. What is this? The decision is an air ball. Game has to go into overtime. Oh no! Due to the fact that Sterling is a lawyer and has gobs of gold coins at his disposal, many legal analysts argue that the forced sell could take years. In fact, if Sterling decides to sue to the NBA over the decision to sell, while declining to pay the 2.5 million dollar fine, the legal battle could last for years. In fact, the litigation might outlast him and his remaining years of life on this here earth. In relations to backstage racism, reports have indicated that Sterling and his ex-wife, Rochelle, have previously faced different discrimination lawsuits. In 2005, Mr. Sterling settled a housing discrimination lawsuit by paying nearly 5 million dollars to more than a dozen tenants within his rental properties in Los Angeles County. In addition, it has been reported by apartment tenant and managers that his previous wife vilified Blacks and Latinos. In a 2009 legal deposition, a one-time tenant noted that Mrs. Rochelle Sterling called him a “black m—f—“. “I asked her again, I asked her, ‘would you reduce the rent?’” Darrell Rhodes said in the deposition. “And she said, ‘who do you think you are, you black m—f—.’” During the same litigation, a site manager working for the Sterling family testified that once during a visit from Rochelle Sterling, “She said ‘Oh, my God. This is so filthy. I can’t remodel my apartments the way that I want because Latinos are so filthy.” We cannot forget famed star basketball Elgin Baylor’s shocking revelations that indicate that “Sterling brought women into the locker room to look at the players “Black bodies” while they showered. Baylor also has publically commented on Donald Sterling’s lack of willingness to “‘fairly compensate African-American players’”. Technical foul goes to the Sterlings. This type of behavior is nothing new for anyone who has personally associated or professionally dealt with him. 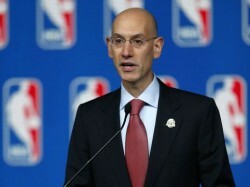 Instead of the former NBA commissioner David Stern, applying strict criticism to his players in terms of their dress code and behavior displayed on the court, he should have focused on not only the lawsuits of Mr. Sterling, but what other people of color were saying about the LA Clipper owner. But then again, why should he? It is apparent to me that his behavior was tolerated—by the one-time commissioner and other owners. None of them previously and publically called attention to the racist behaviors of Sterling. Out of the principal owners of NBA teams, 98 percent are White. Therefore, it can be argued that his brazen behavior is both acceptable and not new among his billionaire NBA peers. Furthermore, their lack of a united front illustrated after Commissioner Siler’s decision gives credibility regarding the argument. They all were complicit. Foul! Foul! Foul! Finally, technical foul and ejection from the game is called on the NAACP. Really? You want to give him the Lifetime Achievement Award? The L.A. branch of the NAACP may have decided not to go along with awarding Sterling, but this desperate act does not let them off the proverbial hook. Regardless of Sterling’s previous donations and tickets given to poor Black chillins’ in the hood, why didn’t it cross the minds of one of my people’s leading organization that the donations were only given to strengthen his image and redirect criticism after his previous legal issues? Is it that easy to buy our convictions these days? Have we as a society lost our conviction for justice? Apparently so, if the fans were still buying the tickets and clothing before Sterling’s comments were made to the public and clothing. This is apparent if the NAACP took monies from a person who has been sued numerous times for racial discrimination. It would seem to me that all is fine as long as your feelings regarding Blacks and Latinos are kept among those who accept your racist ideologies and you place money in the right hands, things will continue to stay the same. The media will continue to misdirect the issue. People will move on to the next news cycle without utilizing this moment for true introspection. I guess then that is it. Game over. Injustice wins again.